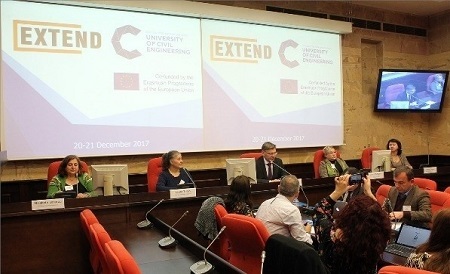 RTU FSD International projects unit has succesfully initiated Erasmus+ KA2 Capacity Building in Higher Education project entitled EXTEND “Excellence in Engineering Education through Teacher Training and New Pedagogic Approaches in Russia and Tajikistan”. Project consortium consists of 11 higher education institutions coming from Latvia, Romania, Portugal, UK, Russia and Tajikistan. 1) Development of comprehensive model and descriptor of the competences needed for the university teacher within engineering disciplines. 2) Establishment of a network for centres of Excellence in Engineering Education (EXTEND centres), offering training courses, research and consultations in engineering disciplines in each Russian and Tajik partner university. 3) Development of suitable training program for PhD students and teachers in teaching engineering disciplines. 1st consortium meeting took place in Moscow 20.12.2017. – 21.12.2017.